Just one year into its successful redesign, the 2010 Dodge Ram is looking as big and bad as ever. For 2009, the truck saw increased fuel economy, a new crew cab option, a sizable step up in interior refinement and much improved ride quality. It became the ultimate luxurious and capable full-sized pickup, marked by Ram badges the diameter of an ostrich egg. For 2010, just a few modifications have been added, including iPod integration, park assist and a new tire pressure monitoring system. 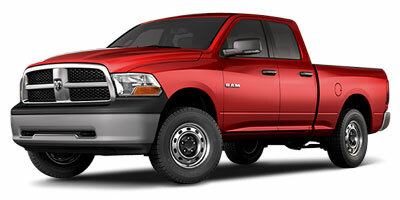 Dodge has also increased the gross combined weight rating up 1,500 lbs to 15,500 lbs. That means your Dodge Ram Laramie – the top-of-the-line model – is still powered by the epically impressive 5.7-liter HEMI V-8, an engine that puts out 390 horsepower and 407 lb-ft of torque. It also has features that will stun F-150s into googly-eyed wonderment, like the cavernous and convenient Rambox system. The truck segment is a fiercely competitive one, even with dramatic changes in the economy taking place, but the Ram has all the right components to make it one of the best full-sized trucks out there. A new coil-spring five-link rear suspension drastically alters the cornering capabilities of the Ram, keeping it level in turns and softening bumps. The, dare we say, luxurious interior can comfortably seat six. We doubt you could gather enough gear to fill the 42 storage bins found throughout the cabin and the optional RamBox on the side of the bed. The Laramie doesn’t start cheap, and many won’t see the reasoning behind buying a nearly $40,000 truck. Rear legroom in the quad cab is three inches less than the crew cab and can be tight for taller passengers; drivers don’t even have the option of a regular, three-person cab with the Laramie. Just don’t bring up the topic of fuel economy. 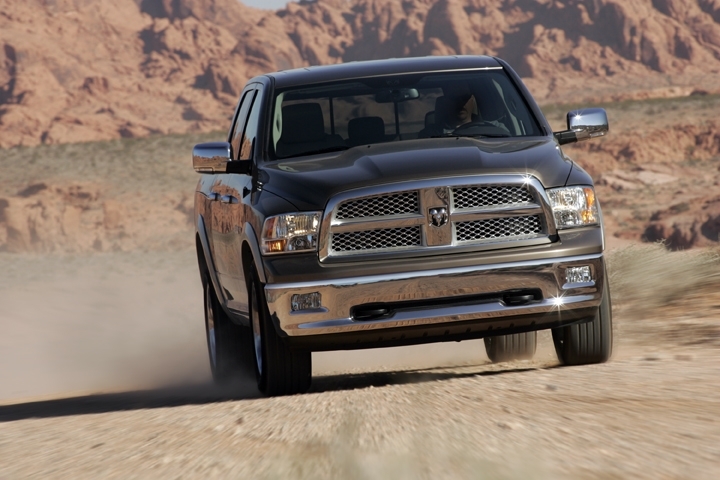 With the 5.7-liter V-8 HEMI, you can really feel the Ram dig into the road. Towing an Airstream, as we were able to do, is a piece of cake with the 10,500-lb tow rating. The steering is heavier and more direct than the previous generation’s, and the Ram feels good and grounded. Many trucks ride over the road, giving you a disconnected feeling – not so with the Ram. With individually tunable springs, the all-new suspension that replaces the leaf spring system – a first in its class – dulls road irregularities better than any rig we've laid our hands on. All trims cut through the air more easily than the previous model, and the five-speed automatic transmission shifts quickly and smoothly, even if second gear does seem to be quite the drop from first. This is not your grandfather’s old Mopar truck, that's for sure. 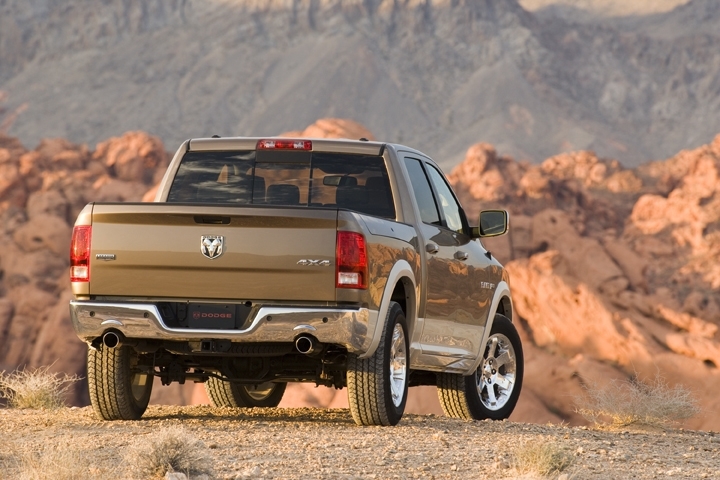 The Laramie houses the largest of the Ram’s three engines, a 5.7-liter HEMI with 390 horsepower and 407 lb-ft of torque. It’s mated to a five-speed automatic transmission and puts power to two or all four wheels. 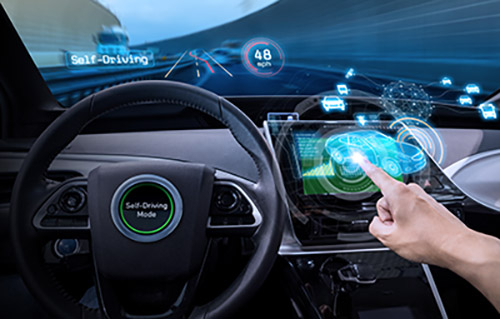 The engine utilizes the Multi-Displacement System, which reduces fuel consumption by deactivating half of the engine’s cylinders in fuel saver mode. A dual exhaust and platinum sparkplugs are standard for the Laramie as well. As mentioned, the Ram contains 42 storage spaces in various locations throughout the cabin, including two glove boxes and under-floor bins. 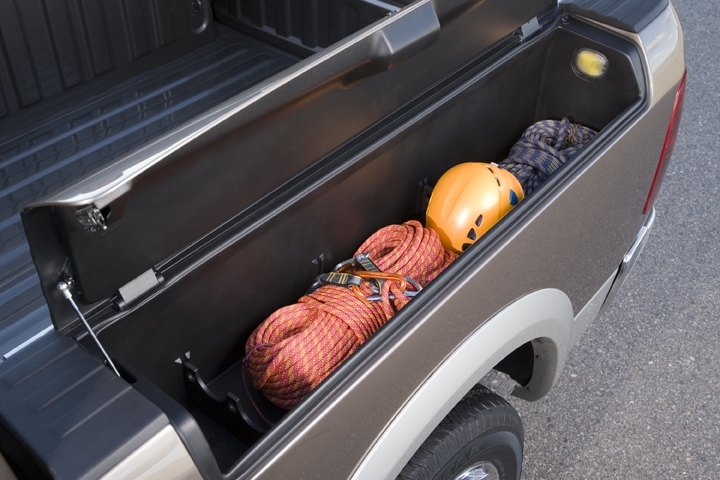 The highlight of them all is the Rambox (available with the Crew Cab), which consists of two lockable bins that utilize the space over each wheel well. They’re large enough to fit a set of golf clubs, wet gear, 240 beer cans and ice (there’s a drainage plug) or anything else you may think up. We’re talking fully loaded here, folks; the Laramie comes equipped with a surfeit of gizmos and gadgets, and those that don’t come standard are all available for a few more pennies. Park assist helps drivers squeeze the mammoth truck into tight spots, and a rear backup camera ensures smooth reversing (though don’t try to use it with the tailgate down or you’ll get a great view of asphalt). A 506-watt surround-sound audio system distributes music throughout the cab and can be controlled through the nav touchscreen. Casually skim over this section, pretend it isn’t here. Fine, read on if you dare. The 2WD Laramie gets 14 mpg around town and 20 on the highway, identical numbers to those of the F-150. Not terrible, right? However, fuel economy numbers drop to 13 city, 18 highway when pushing power to all four wheels. As mentioned earlier, the Ram does come with a Multi-Displacement System to help reduce consumption. 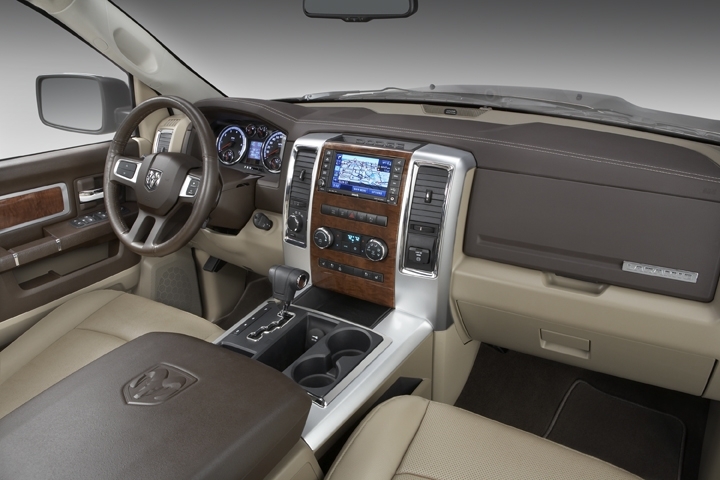 An improved interior space was on the wish list of most Ram owners before the 2009 redesign, and 2010 continues to deliver upscale cabins for this Dodge. The high-end Laramie features options like a touchscreen infotainment center, wood applications and heated (both front and rear) and cooled front seats. The Ram still looks as iconic (and enormous) as ever. 2009’s changes included lowering the windshield wipers, adding the rear spoiler lip and lowering the side sills to cover the Ram's frame – all improving aerodynamics. The Ram badges are prominent, and the grille sits in the shadow of the rig’s aggressive nose. 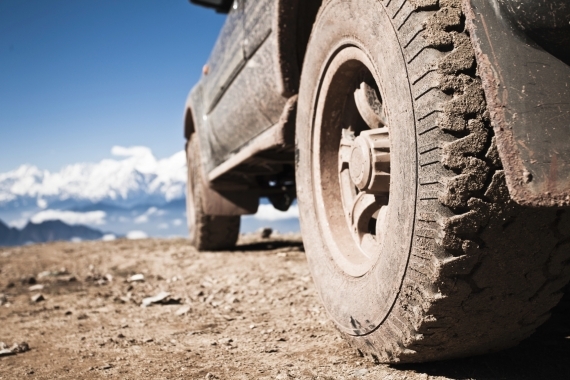 The Laramie rides on massive 20-inch wheels and comes in two bed sizes: a 5’7â€ crew or 6’4â€ quad. The Laramie finds its place on the pricier side of the segment’s tight pricing spread, starting at $37,780 for the Quad Cab and going up to $39,935 for the Crew 1500. 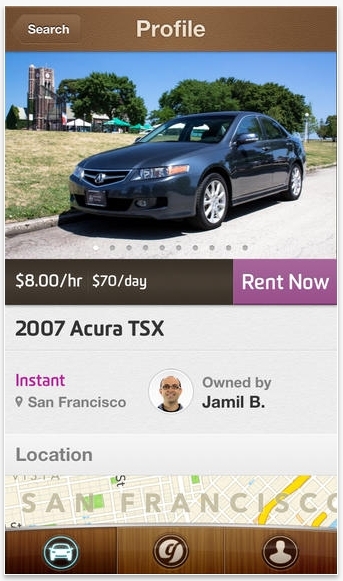 Add about $4000 for all-wheel drive capability. Stiff competition comes from the Nissan Titan LE ($36,420), Ford F-150 Lariat ($33,205), Chevrolet Silverado LTZ 1LZ ($38,205) and Toyota Tundra Limited ($36,560). Dodge is still riding the high from a successful redesign, and the Laramie is the pinnacle of the truck’s capabilities and utilities. The HEMI is impressive in its sheer capacity, and this truck has proven once again that it can really move just about anything. Comfort and convenience are at the forefront of the Laramie’s design as well, and you’d be hard-pressed to find a smoother ride in a truck.